Once a year, the Vice-Chancellor’s Management Council spends a whole day at Campus Gotland. We assembled for departure brutally early on Monday morning, but were rewarded by the stunning sight of the blood moon, a celestial phenomenon that astronomers tell us will next recur 10 years from now. 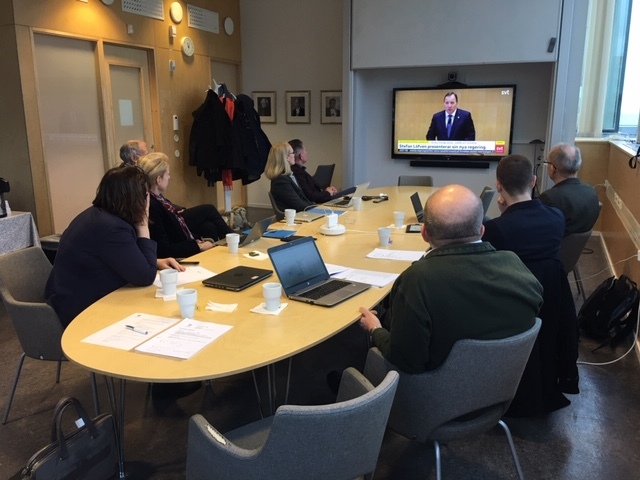 We devoted the morning session to a regular Management Council meeting, with a break to watch the Statement of Government Policy and the presentation of the new ministers. In his statement, the Prime Minister emphasised the importance of research for Sweden as a knowledge nation, and pledged that both free and challenge-driven research will be strengthened. This is good. Education and schools also received a lot of attention. The plans for yet another reform of teacher education are cause for concern – what is really needed is surely a long-term perspective and a chance to get on without being disturbed. Otherwise, the most prominent issues were sustainable development and the environment, health and social care, integration, security and democracy. We also got a new minister for higher education and research, Matilda Ernkrans. We have already invited her to visit us for a presentation of Uppsala University and look forward to a good working relationship. After the Management Council meeting we had lunch with Campus Gotland’s students’ union Rindi. One of the priorities for both the students’ union and us is student housing with 12-month contracts. One challenge for the students’ union is to adapt its working methods in response to the many new international students. The afternoon began with a strategic discussion on the development of Campus Gotland. In July it will be six years since the merger and we can say it has been a success story. So far the focus has mainly been on strengthening undergraduate education. Fifteen new degree programmes have started since 2014. Last year we had more than 1,100 students on campus and more than 1,000 distance students. A fifth of the students are international. The University’s only two international Bachelor’s programmes are in game design and are taught on Gotland. More degree programmes will start in the autumn. This is an impressive development. Now the focus is shifting more to issues of strengthening research and research environments. Much has already started and is in progress – sustainable tourism, energy, digitalisation, conservation, Blått centrum (a centre for water-related issues), children’s health. There are plans to launch an interdisciplinary graduate school on the theme of water and energy. If all decisions are taken, a dozen doctoral students placed on Gotland will be admitted in the coming year. Rapid development generates new challenges. The premises are beginning to feel crowded, larger teaching rooms and more offices are needed. The presence of so many new international students makes new linguistic demands on staff, teachers and students. We need to improve the technology for distance education as well as opportunities for staff to participate in continuing professional development and meetings. The merger phase must soon be regarded as over and we are entering a new, more regular phase. The Advisory Board for Campus Gotland has been working on its input to the revision of Uppsala University: Mission and Core Values, and this has raised the issue of Campus Gotland’s ‘special status’. To what extent will we continue to need separate goals, measures and forms of management for Campus Gotland? This is a discussion we need to pursue over the coming year. However, the fundamentals are clear: activities in Visby will be firmly integrated in Uppsala University’s regular structures and quality systems, while ensuring that we take advantage of the unique opportunities for multi- and interdisciplinarity and the development of the cohesive campus environment, and that the activities are clear and transparent to our partners in the Gotland community in which they are set. The afternoon continued with a meeting with staff at Campus Gotland at which we discussed ongoing developments nationally and internationally, at the University and in the different disciplinary domains. The day’s last stop was Region Gotland for a meeting with politicians and officials, which has become an annual tradition. The agenda focused on follow-up of our strategic collaboration agreements with the region. We have a good cooperative relationship, which among other things offers our students the chance to do independent degree projects and other projects in various parts of the region’s administration. We saw a presentation of a student project in which our game design students have worked with student health services in the region to develop a game to promote health and wellbeing among students with functional challenges. A student project, an idea, that has potential for development into a product and perhaps a business. Another example is cooperation between the teacher education programme and our 10 partner schools in the region. This gives our students the chance to work one day a week in school, a ‘trainee position’. After a long day we returned to Uppsala, a bit tired but above all inspired. Campus Gotland has really become an essential and dynamic part of Uppsala University.